On the outbreak of war the early euphoria of Rupert Brooke's hymn to youthful opportunity, Peace 1914 , was typical of the popular mood. It is contrasted in our design with a vivid visual representation of the losses suffered in the early engagements of the war by the British Expeditionary Force. By the year's end the ranks of Britain's small professional army were decimated. One of a series of 1914-18 designs marking the centenary of the conflict. 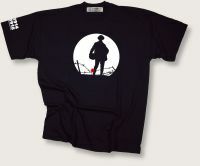 T-shirts as 'Testaments of War' to remember the courage and the sacrifice, to resist the deadly causes and lethal consequences. Unisex sizes. Small (36 inch chest/90cms), medium (40 inch/100cms), large (44inch/110cms), XL (48 inch/120cms) and XXL (52inch/130cms). Available as listed in drop-down menu below.